Saturday at 13:00 at the Noisy Square 2 tent (please be on time if you really want to participate). If you need to get a taste for the type of arguments that have been made already you can check out this, this, this and even this. What are the limits to inclusion? 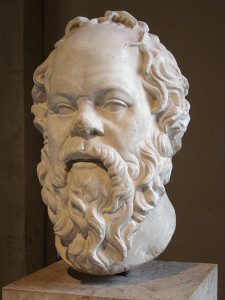 The Socratic conversation is a method for groups to explore philosophical questions. The basis of the conversation is the experience of the participants. We trust their own thinking. There should be a willingness in each participant to have a conversation according to these rules. What you say should be based on your own experiences and thoughts, there will be no references to authority. It is important to really listen to each other. This means that you can only speak if you are capable of summarising what the person speaking before you has said (it not about making your point). It is important to remember we are exploring an issue together, this is not a debate. A word of warning: in many way this is an experimental session. As a community we are not used to conversing with each other in this way. This way of working is new for the moderator too. The chosen topic might work very well (it is close to people’s own experiences right now), but it might also be too hard of a topic to make any real progress on, in such a short (and compressed) time. Your mileage might vary, just saying.